Western Canada’s Cree people have been gazing at the skies for millennia. 'Legends of the Northern Sky' details their interpretation of the night sky. 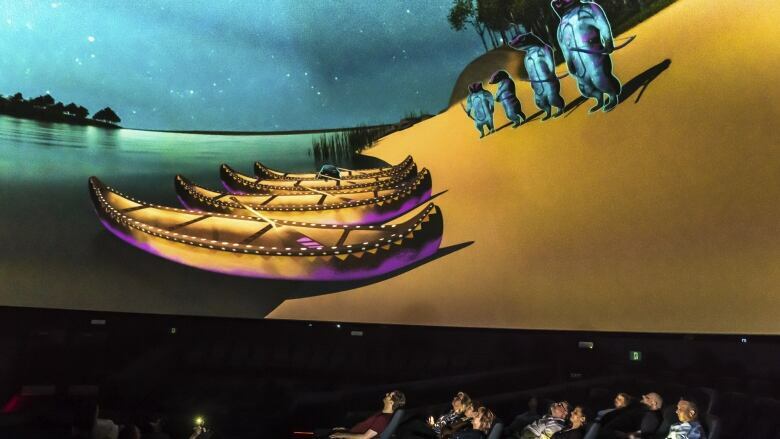 Legends of the Northern Sky, the first full-dome digital projection film to play at the Ziedler Dome in more than 30 years, is a local production featuring students from Ermineskin Elementary School in Maskwacis. One of the film's storytellers is Wilfred Buck. He's an expert in Indigenous astronomy and known to kids as "the star guy." "The film is based on research that I have done in the last 13 years," said Buck, who has studied First Nations astronomy and the connection Western Cree people have had to the sky. "It was extensive research and a lot of it, we realized, was based on ceremony and based on the ceremonial songs and how they connect from the stars to us here on earth." The film is part of the Telus World of Science's efforts to tell local stories linked to science. "It's not just a story of the sky," said CEO Alan Nursall. "It's a story about how the sky and the stars are seen and learned from by people who lived here." Cultures around the world make their own connections to the constellations, Buck said. "A lot of them is in relation to what's happening in the environment and maybe some of the social norms that people have," he said. The movie includes a number of stories, from Ocek the fisher to a story about the big hole in the sky, also known as Pleiades, the Seven Sisters. "The Pleiades are a very interesting group of stars," Buck said. "When they're talking about a hole in the sky, they're referring to spatial anomalies, wormholes, they're talking about alternate realities here." Buck began gravitating towards the stars as a five-year-old while growing up in northern Manitoba on the Opaskwayak Cree Nation near the Saskatchewan border. "I remember laying on the banks of the river at night and looking up at those stars, especially in the fall time, and just totally blown away by the immensity of it all," Buck told Edmonton AM host Mark Connolly Wednesday. His says his curiosity led to a lifelong connection. In the last 13 years Buck has worked closely with elders from Cree, Ojibway and Lakota nations and he says he's found many similarities in how indigenous peoples saw the sky and their connection to it. "You meet a lot of amazing people," said Buck who claims to have connected stories with 32 constellations so far. Buck shares his knowledge with the help of a portable planetarium in collaboration with the Manitoba Museum planetarium. He works with two domes: one 15 meters high and 16 meters across which fits 30 students and a bigger one fitting 50 students. Inside, constellations and stories about the stars are projected onto the domes. Buck tours his portable planetariums to about 55 band-operated schools in Manitoba. Buck says his research and the movie is just scratching the surface. "The elders told me that every visible star that you can see with the naked eye when you're standing outside at night had a constellation, had a name and had mythology attached to it. So we have lots to research, to rediscover."